"Creator of the Next Generation" is the ninetieth episode of the Yu-Gi-Oh! VRAINS anime. It first aired in Japan on February 20, 2019. Bohman, who aims to become a next-generation Ignis, appears before Blue Maiden, Skye Zaizen's avatar. The Ignis Aqua refuses to accept Bohman's ideals, while Blue Maiden wants to take back her friend Miyu's consciousness. Thus, they challenge him. Despite losing the AI Haru, Bohman is disturbingly calm as he Duels, however Blue Maiden and Aqua fearlessly stand together against him. Blue Maiden Normal Summons "Marincess Sea Horse" (1400/1000). Blue Maiden sets her Level 4 or lower "Marincess" monster in the Link Arrows to Link Summon "Marincess Blue Slug" (1500/↓) to the Extra Monster Zone. As it was Link Summoned, its effect activates, letting Blue Maiden add a "Marincess" card in her GY to her hand. She adds "Sea Horse". She then activates the effect of "Sea Horse", Special Summoning it to a zone her "Marincess" Link Monster points to. She Special Summons to the zone pointed to by "Blue Slug". Blue Maiden sets her two WATER monsters in the Link Arrows to Link Summon "Marincess Coral Anemone" (2000/←↓) to the Extra Monster Zone. She activates the effect of "Coral Anemone", letting her Special Summon a WATER monster in the GY to the zone this card points to. She Special Summons "Blue Slug" (1500/↓) to the zone "Coral Anemone" points to. Blue Maiden then Sets her two or more WATER monsters to the Link Arrows to Link Summon "Marincess Marbled Rock" (2500/←↓→) to the Extra Monster Zone. Blue Maiden activates the effect of "Marbled Rock", targeting an adding a "Marincess" card in her GY and adding it to her hand. She adds "Sea Horse". Blue Angel Sets a card. As there are no monsters in the Main Monster Zones, Bohman activates the effect of the "Hydradrive Booster" in his hand, Special Summoning it (0/0) in Attack Position. Bohman sets his "Hydradrive" monster in the Link Arrows to Link Summon "Coolant Hydradrive" (1000/↓) to the Extra Monster Zone. Bohman Special Summons a second "Hydradrive Booster" (0/0) from his hand in Attack Position via its own effect. Bohman sets his "Hydradrive" monster in the Link Arrows to Link Summon another "Coolant Hydradrive" (1000/↓) to the zone the first "Coolant Hydradrive" points to. As a Link Monster is pointing to a Spell & Trap Zone, Bohman activates "Judgment Arrows" in that zone. Bohman Normal Summons a third "Hydradrive Booster" (0/0). He sets his "Hydradrive" monster in the Link Arrows to Link Summon a third "Coolant Hydradrive" (1000/0). Blue Maiden's hand contains "Sea Horse", "Marincess Crown Tail" and "Marincess Mandarin". Bohman sets his three "Hydradrive" Link Monsters of the same Attribute to the Link Markers to Link Summon "Cubed Hydradrive Lord" (2300/). 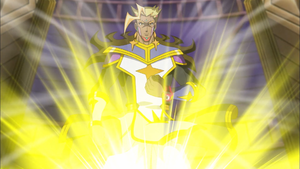 The effect of "Lord" activates when its Summoned, letting Bohman choose two Attributes among WATER, WIND and FIRE and treat "Lord" as also having those Attributes. He chooses WATER and FIRE. "Lord" negates the effects of all monsters Blue Angel controls that have the same Attribute as it, so the effects of "Marbled Rock" are negated. "Lord" attacks and destroys "Marbled Rock", with the effect of "Judgment Arrows" activating, doubling the ATK ("Lord": 2300 → 4600) of Link Monsters it points to during damage calculation (Blue Angel: 4000 → 1900). As it destroyed a monster of the same Attribute as it by battle, the effect of "Lord" lets it attack again. As a "Marincess" Link Monster she controls was destroyed by battle or card effect, Blue Maiden activates her face-down "Marincess Snow", targeting and Special Summoning a "Marincess" Link Monster from her Extra Deck with a lower Link Rating and treating that Special Summon as a Link Summon. The Summoned monster will be unaffected by the opponent's card effects. She Special Summons "Marincess Crystal Heart" (0/) to the Extra Monster Zone. "Lord" attacks "Crystal Heart", but Blue Maiden activates the effect of "Crystal Heart" as it or a "Marincess" Link Monster it points to is being targeted for an attack. This lets her send a "Marincess" monster in her hand to the GY to prevent the monster's destruction by battle and prevent battle damage. In addition, "Crystal Heart" renders monsters it battles unaffected by other card effects so "Judgment Arrows" does not raise the ATK of "Lord". Bohman Sets a card. Blue Maiden draws "Marincess Bubble Blast". As her opponent controls a Link-3 or higher monster, she activates "Bubble Blast" by targeting a Link-2 or lower "Marincess" Link Monster she controls. She targets "Crystal Heart". Now, if a "Marincess" monster is Normal or Special Summoned to a zone "Crystal Heart" points to, she can inflict damage to Bohman equal to the total of Link Ratings of "Crystal Heart" and any monsters it points times 500. Blue Maiden activates the effect of the "Sea Horse" in her hand, Special Summoning it (1400/1000) in Attack Position to a zone her "Marincess" Link Monster points to. "Lord" negates its effect as it is the same Attribute. As he controls a co-linked Link Monster, Bohman activates his face-down "Interference Canceller", which will make effect damage 0 a number of times per turn equal to the targeted monster's Link Rating. He targets "Lord", letting him make effect damage 0 three times. This page was last edited on 14 March 2019, at 03:10.